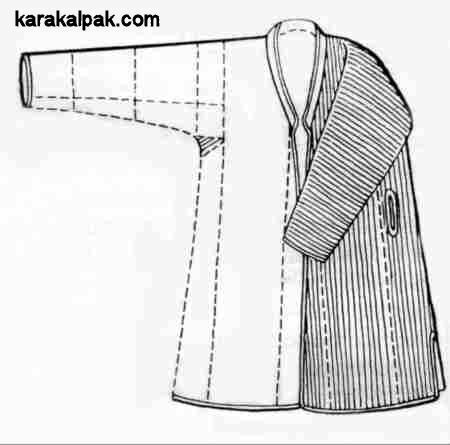 The Karakalpak man’s shapan is a lined, long-sleeved coat or khalat, which is normally quilted with cotton interlining. It is most commonly made from local alasha, a narrowly striped cotton textile with a polished finish, usually lilac, blue, or purple in colour. The front is overlapping with no means of fastening and there are two lower side vents for ease of movement. There is a narrow collar, which is raised at the back but lies flat on the chest at the front. There is sometimes a single pocket. The edges of the coat, including the cuffs, are finished with a braid of raspberry red jiyek, which is woven directly onto the coat by hand. A traditional Karakalpak man's ceremonial shapan, probably 1920s or early 1930s. Shapans were normally fastened by a waist belt known as a belbew. For festivals and holidays shapans were tied with a brightly coloured silk kerchief, either a purple, yellow, and green ma'deli or a red, blue, and gold tu'rme. 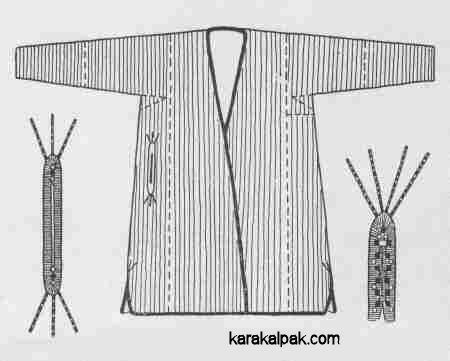 The Karakalpak man's shapan is very similar to the Karakalpak woman's shapan. The one major difference is that the male garment has a collar wheras the woman's does not. The female garment is also more likely to have a pocket and to be decorated with a small amount of embroidery, especially on the jiyek around the pocket and the lower side vents. A traditional Karakalpak woman's ceremonial shapan from the Moynaq region, probably 1920s or early 1930s. Note the jolly Russian printed cotton lining and the embroidered pocket opening. The manufacture of alasha fell into decline throughout the Khorezm region during the 1930s. Today elderly men still wear shapans but modern coats are imported into the region from Uzbekistan, where they are machine made from shiny synthetic textiles. 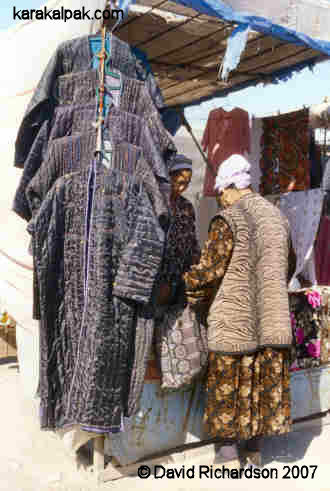 Modern machine-made shapans on sale at the bazaar in Qon'ırat in 2003. 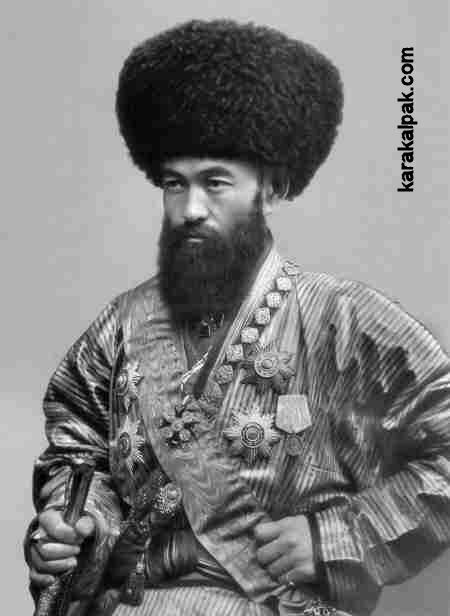 The cut of the Karakalpak shapan is very similar to the shapans worn by the other inhabitants of the Amu Darya delta, which in turn differ little from the chapans of the Uzbeks from Khiva and the central regions of Uzbekistan. The one main difference is that the sleeves of the Karakalpak shapans are shorter and wider at the wrists. Even so it was traditional for the sleeve to cover the hand. details of the decorative embroidery on the jiyek edging of the pocket opening and side vents. From Tatyana Zhdanko's initial review of Karakalpak material culture, published in 1952. 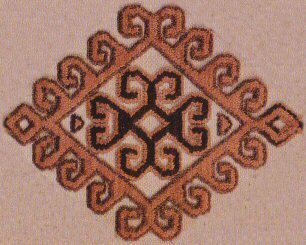 Illustration of the construction of a Khorezmian Uzbek chopon. From Zadykhina and Sazonova's, "Men's clothing of the Uzbeks of Khorezm", 1979. 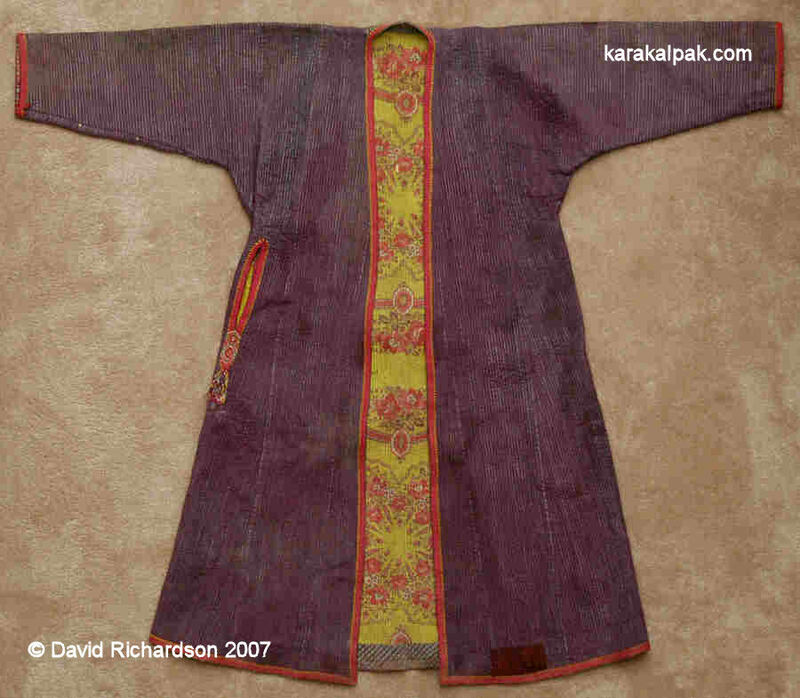 It is unlikely that the shapan was a traditional item of Karakalpak costume. Along with the technique of alasha making, it seems to have been adopted during the last two centuries from the more settled Uzbeks living in the Khiva oasis. Photograph of Islam Khoja, the Divan-begi (Prime Minister) of the Khivan Khanate, wearing a very fine unquilted Khivan chapan. Islam Khoja was unusually progressive and popular and was assassinated in 1913, probably with the Khan's tacit approval. 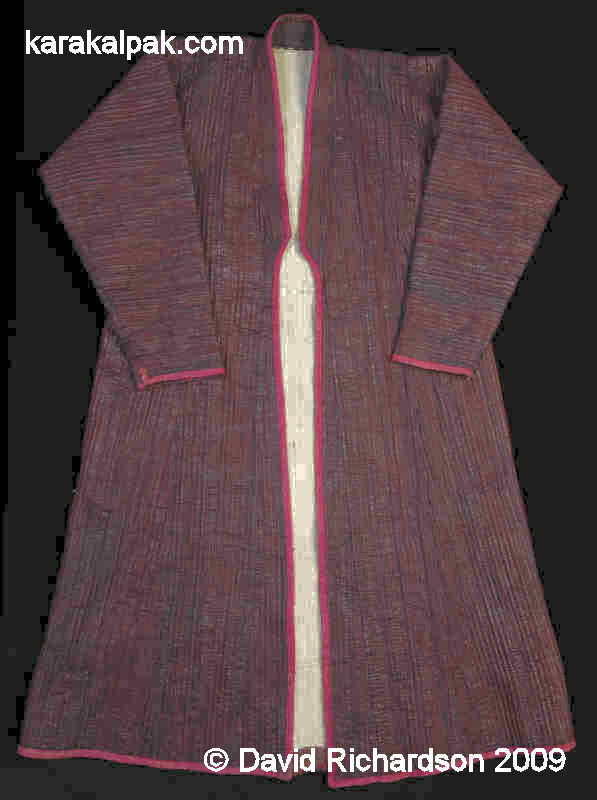 "With respect to Khivan manufactures, in high repute is the Urgendj Tchapani, or coat from Urgendj; the material is a striped stuff of two colours (of wool or silk, often made of the two threads mingled), this is cut to the fashion of our dressing gowns, ..."
"The Tchapan (upper coat) is the chief article of a man's wardrobe; it is not unlike our European dressing gowns, and cut out in Khiva so as to fit the body pretty well; in Bokhara it is already so large that two people can envelope themselves in it, and in Khokand it is widest of all." There is no Qazaq or Turkmen equivalent to the Karakalpak shapan or the Uzbek chapan. This site was first published on 11 March 2007. It was last updated on 26 February 2012.